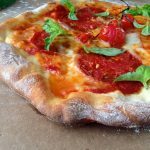 How to make an easy, authentic pizza Margherita at home, from scratch with just a few simple ingredients and a pizza stone. Anyone can make this, I promise! Video below! Named after Queen Margherita of Italy as history tells us, Margherita pizza is meant to look like the Italian flag: Red, White and Green. White Mozzarella di Bufala cheese -made from domesticated water buffalo milk (fresh mozzarella will do as well If that’s what you have). Green basil leaves (Genoese), tough I have to confess fresh oregano has my heart too. In true Neapolitan fashion your pizza dough needs to be no thicker than 3 mm, so do your best kids. 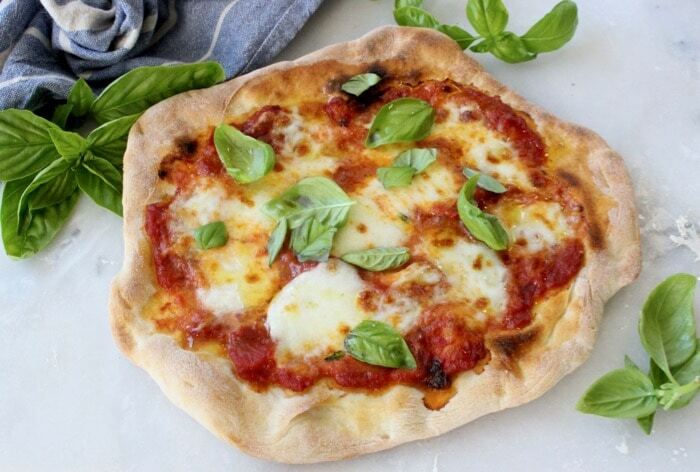 This will be very easy If you are using my authentic thin crust Italian pizza dough recipe. Legit! 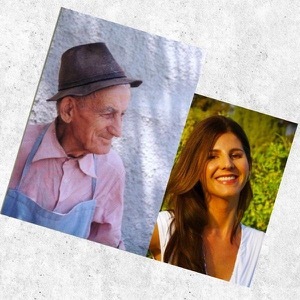 Let’s talk about the cheese! 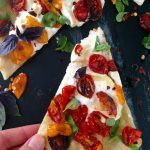 There’s only one right way to go here and that is with Buffalo Mozzarella forever and ever! Really important to dry it well on paper towels before adding to your pizza so it won’t make your pie soggy. 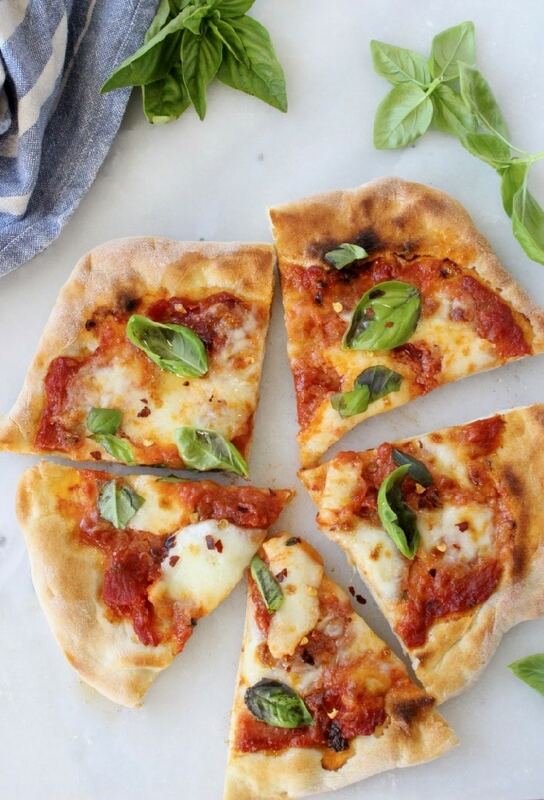 Best part about this pizza is that you can bake it on a hot pizza stone (<–amazon affiliate – I’ve been using this one for about 10 years now and still works like magic) as high as your oven will go. Or you can grill it in a smoking hot cast iron skillet and finish it under the broiler for nice little char marks. I throw it under the broiler regardless. Because most of the time I have some of this Marinara sauce in a jar in the fridge I naturally use that. However, If you don’t feel like cooking sauce, just use a can of San Marzano tomatoes, crush them in a bowl with some olive oil, grated garlic and fresh oregano. Season with salt and use that as a pizza sauce. I swear it is fantastico! There is absolutely no pepperoni, no balsamic glaze, no egg, no ricotta, no spinach you guys. Keep those toppings for a different kind of pizza. 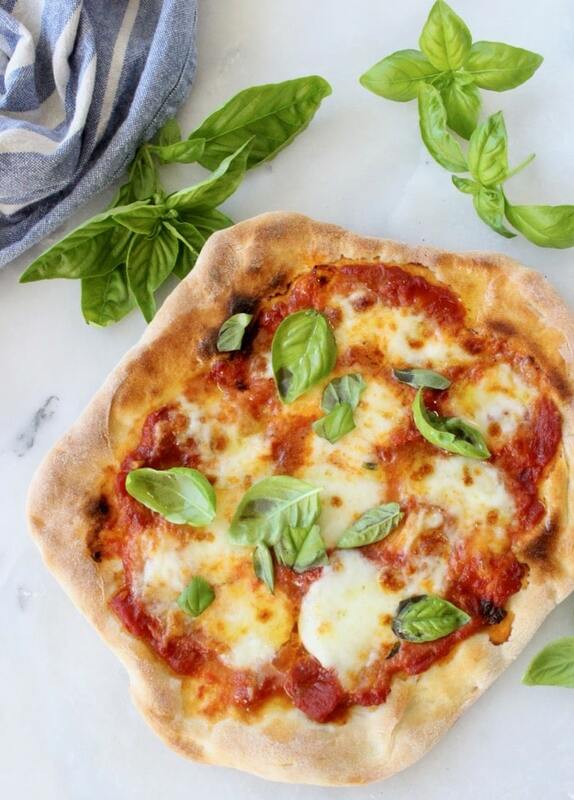 Margherita pizza is the perfect vegetarian meal next to a good glass of Italian Vino. True story! I included the recipe for my thin crust Italian pizza dough below, however I’d like you to know this isn’t math, and depending on the flour you use you will need to adjust the ingredient amounts. Below is a guide. The important thing is that you end up with a smooth dough that isn’t too dry and isn’t too wet where it is difficult to work with. It should be just a little sticky to the bottom of the bowl. Another important detail is that we will cook the pizza dough for a couple of minutes before topping it. This is how you get a crispy crust that isn’t gonna be soggy at all. Use all the recipe instructions below and instead of heating up the oven just heat up a cast iron griddle or skillet. 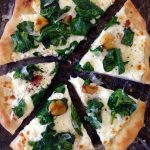 Just like I did here with this Spinach Artichoke Pizza Bianca! Grill the pizza for about 3 minutes on high flame until nice grill marks form. Use a pair of tongues and flip it. At this point you will spoon the sauce on top and sprinkle with the mozzarella cheese. Loosely cover with aluminum foil to help the cheese melt along quickly, as it will only take a couple minutes on the second side If your pan is hot as it should be. 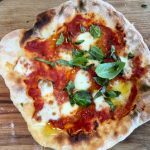 How to make an easy, authentic pizza Margherita at home, from scratch with just a few simple ingredients and a pizza stone. Anyone can make this, I promise! 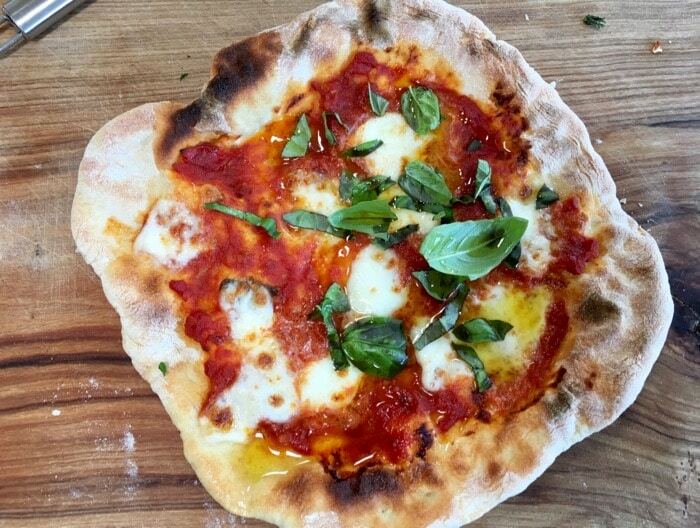 Preheat your oven with a pizza stone inside to 500”F or as high as it will go. Transfer to a cutting board and using a sharp knife cut the dough into 8 pieces. Form each piece into small round balls and place them on a very lightly oiled baking sheet at least 3 inches apart from each other. Loosely cover with plastic wrap and allow to rise at room temperature for at least 2 hours. Sprinkle the counter with a little bit of flour, take one piece of dough and press down on it with your fingers until you have 1/2" thick circle or oval. Using your fists and knuckles start stretching the dough until 10" in diameter making sure not to tear it ( this should be easy since we are making small pies). 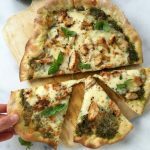 Place the pie on a pizza peel or a piece of cardboard and transfer it to the preheated pizza stone ( sprinkle a little bit of flour or corn meal on the stone just before). Bake for 2 to 3 minutes then take it out of the oven. Spoon a couple of tablespoons of the Marinara sauce in the middle of the pie and gently spread it around into a thin layer leaving about 1/3 inch sides. 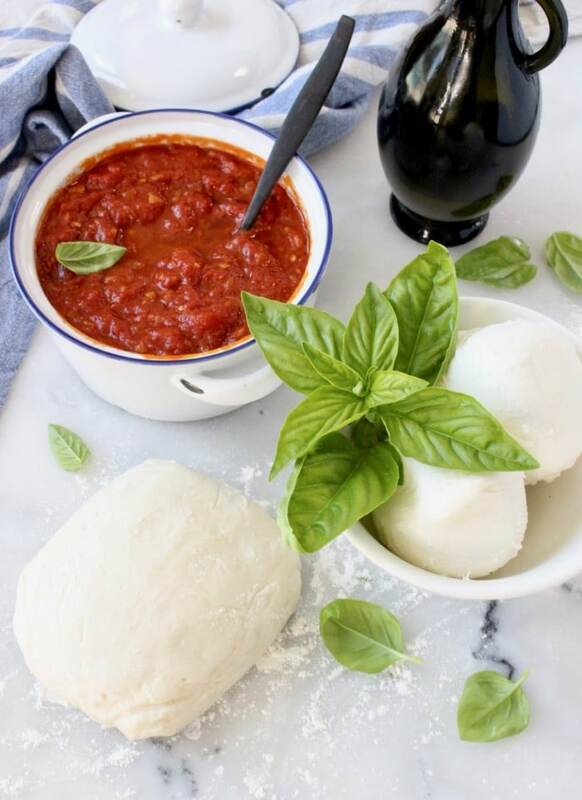 Tear some of the Mozzarella di Bufala cheese on top and transfer the pie back into the oven for another 4 minutes or until the cheese has melted. Meanwhile preheat your broiler and as soon as you remove the pizza from the oven you pop it under the broiler flames for about 30 seconds or so. Keep a close eye on it so you don’t completely burn it. Transfer to a cutting board and allow it to sit for a few minutes for the cheese to set. Finish with a drizzle of extra virgin olive oil, sprinkle with fresh basil and enjoy. Repeat the process with the remaining pies or refrigerate for later. 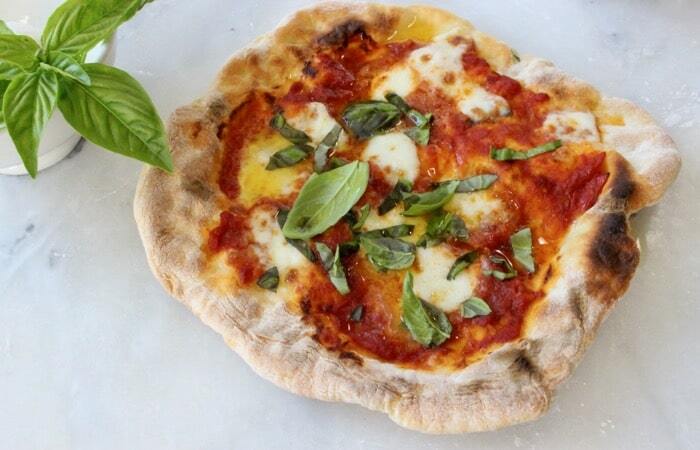 Homemade Pizza Margherita Recipe Video! This pizza was amazing, just like I remember eating in a small pizzeria in Italy years ago. Crispy crust and the balance of flavors was divine. Keeper!